Become a certified Yin Yoga Teacher in 2019. All Yin Yoga Teacher Training courses with Sarah Owen are recognised internationally by Yoga Alliance International (YA). Based in Sydney, Sarah teaches a balanced approach to Yoga which encompasses both mindful movement as well as introspective long-held poses (yin yoga). She is endorsed by Sarah Powers' Insight Yoga Institute (USA). She is known for her Yin Yoga & Mindfulness Teacher Training courses, which have been well-received and highly-recommended by graduating students. Sarah is also a qualified primary school teacher with over 15 years' teaching experience including teaching yoga and mindfulness in schools. She is the creator of Natural Mindfulness for Children. Sarah offers private mentoring sessions based on the Internal Family Systems (IFS) Therapy model, as well as private restorative yoga classes from her small private practice in Sydney. "I have been coming to Sarah's yin classes for years. I have moved suburbs and live nowhere near where she teaches but still keep coming back to her classes. Why? Because she is one of the most knowledgable and experienced yin yoga teachers in Sydney. She has been a student of internationally acclaimed teacher, Sarah Powers for many many years. It was when I met and trained with Sarah Powers that I fully understood where her depth of experience & knowledge comes from. Sarah has a beautiful calming voice to begin with and her words really speak to your heart. I feel blessed to have met a teacher like her who is happy to mentor me with love, kindness and patience"
"Sarah is a humble and dedicated yoga practitioner. 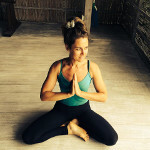 I have had the pleasure of practising yoga with Sarah for the past seven years, in which she has been both my teacher and more recently my mentor. Sarah’s gentle and genuinely knowledgable approach allows for a natural progression of development on and off the mat. Her skilful and broad natured approach to teaching allows for a safe and nurtured space to practice within. Sarah evokes a deepened awareness of body, mind and spirit and provides an understanding of the correlation of this and outer surroundings. Sarah’s holistic approach to teaching and self awareness has allowed me to find a more refined sense of calmness and clarity in my daily life which has greatly benefitted all aspects of my life"